Positive influence as total disinfectant against microorganisms of the digestive tract and the respiratory tract Increases the body resistance. Powerful herb extract for pigeons and hobby animals. Positive influence as total disinfectant against microorganisms of the digestive tract and the respiratory tract. After years of extensive testing, Travipharma now has a world premiere! And, to be precise, in the natural control of most harmful pathogens that occur with pigeons: the Protozoan and bacterial pathogens. 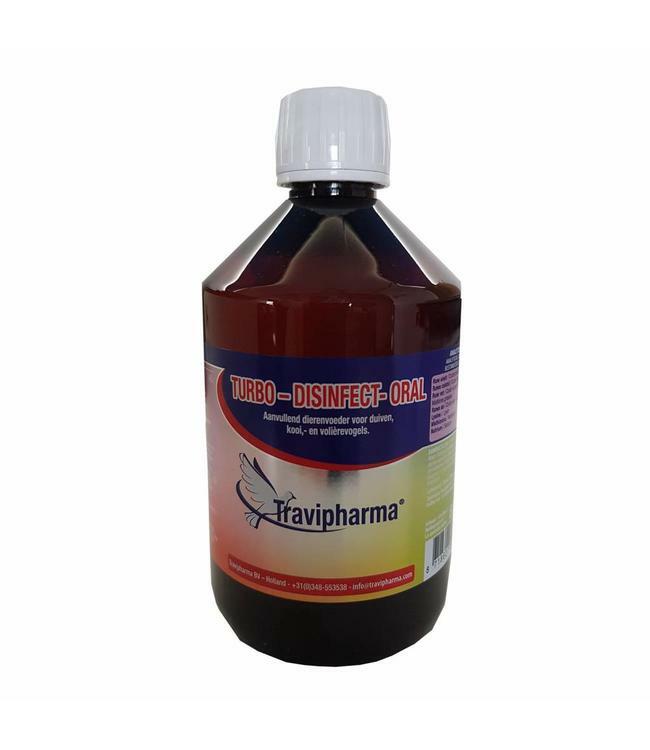 At Travipharma, we succeeded in curing your pigeons and retain them healthy with our new product: TURBO DISINFECT ORAL!! We have already achieved amazing results due to the power of this natural product. These results are immediately visible when observing the texture of beautiful round "marbles manure" in the hatcheries. Even with nesting couples. This indicates that the pigeons possess a healthy digestive system. In addition, the pigeons will become as soft as silk and slide right through your hands. By being free from pathogens your pigeons will become fitter and will be able to perform better. Harmful pathogens will have no single chance, which gives your pigeons the opportunity to excel during important races. Administer Turbo Disinfect Oral after every race in order to ensure improved health results. This medicine provides an enriched body defense system through the biological impulses that this product continues to give to the pigeon. The pigeon becomes stronger and will be better prepared during the travel time in the basket and during the flight, which significantly reduces the risks.